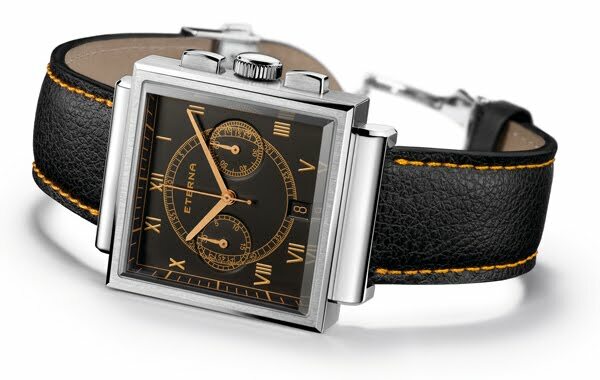 In 2012 at Baselworld, Eterna is pleased to inform connoisseurs of exceptional wristwatch design and collectors of timepieces of striking character of the return of its Chronograph limited edition 1938. At its initial launch, its personality had greatly contributed to Eterna's fastgrowing reputation. Introduced in 2010, the Heritage collection brings to life a selection of notable Eterna achievements from its distinguished past. The collection features, for instance, limited editions of the 1973 Super KonTiki and the 1942 Pulsometer, now joined by the Chronograph, dating from 1938. Reflecting the aesthetic codes of the late Art Deco period, the Chronograph limited edition 1938 is representative of the widespread design research undertaken by Eterna on the chronograph theme. This perfectly balanced design first saw the light of day in 1938. The Chronograph distinguishes itself from the crisply affirmed right angles of its stainless steel case, enhanced by the complex geometry and color scheme of its dial face. They testify both to the self-assured audacity of the designers of the period and to the reason for its inclusion in the Heritage collection. The Chronograph is equipped with the tried and tested ETA 2894-2 selfwinding caliber providing 42 hours of reserve power, developing 28,800 v.p.h. and fitted with 37 jewels. Along with its chronograph seconds hand at center and a 30-minute totalizer at 9 o'clock, actioned by two pushpieces, it displays the hour, minute, running seconds at 3 o'clock and the date. Its matt black dial face features an intricate pattern of gold-toned minute and seconds circles enhanced with nine similarly colored Roman numerals — swept by gold-toned hands. Made of brush-finished and polished stainless steel, the Chronograph case is water-resistant to 50 meters (nearly 165 feet). Its pressed-in case back is numbered 0001 to 1938.
mm abide by the aesthetic expectations of our time. Its raised sapphire crystal, scratch resistant and anti-reflective, and its black genuine leather strap with elegant deployment clasp round out the attractive features of a design that has well earned its place in history. functions : power reserve 42 h; 28,800 v.p.h; 37 jewels; diameter 28 mm (12ó lines); hour, minutes and seconds, display of the date. Dial/hands : black; gold-toned Roman numerals; gold-toned minute track; gold-toned centred hour and minute hands; gold-toned centred chronograph seconds; gold coloured 30-minute totaliser at 9 o’clock; gold-toned running seconds at 3 o’clock; gold-toned date aperture at 6 o’clock. Case/back : polished and brushed stainless steel case; scratch-resistant, anti-reflective sapphire transverse crystal; pressed-in case back with engraved number (0001/1,938); waterresistant to 50m/~165 feet (5 bars); length: 45.50 mm mm; width: 36.00 mm; thickness 13.10 mm. Bracelet/clasp : black leather with orange stitching and polished and brushed stainless steel folding clasp.